Conrad and Brennan Lanouette are the proud owners and founders of Treeworks Professional Tree Care. The Lanouette brothers’ passion for trees along with the outdoors started when they were just small boys on their 150 acre farm/woodlot outside of Lakefield, Ontario. They both graduated from St. Peter’s Secondary School, furthering their education at Sir Sandford Fleming College in Lindsay. Conrad, 15 months older than Brennan, first enrolled in the two year forestry technician program. At the same time, Brennan began taking the heavy equipment operator program while he worked after classes towards receiving his AZ driver’s license. 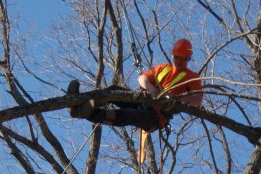 Once they had completed their individual programs they furthered their achievements by enrolling in Fleming’s arboriculture program. It wasn’t long before they were nicknamed by their classmates and teachers as “the brothers”. They both successfully graduated and then took their incredible amount of knowledge and safety awareness into the field. A few months later, the thought of running their own business came to mind. When this thought became a reality, they decided to prepare themselves for all aspects of running a successful business by enrolling in a business course. Well prepared, the brothers put their superior work ethic and dedication to the test by starting their business Treeworks in 2009. 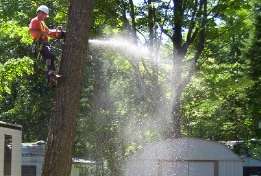 Treeworks is fully insured and registered company providing a wide range of tree services to the Cities of Peterborough and Kawartha Lakes, and surrounding area. They are equipped to service specialized lots including island properties. The Lanouette brothers pride themselves on their extensive knowledge of arboriculture and are constantly sharing that with clients and employees.